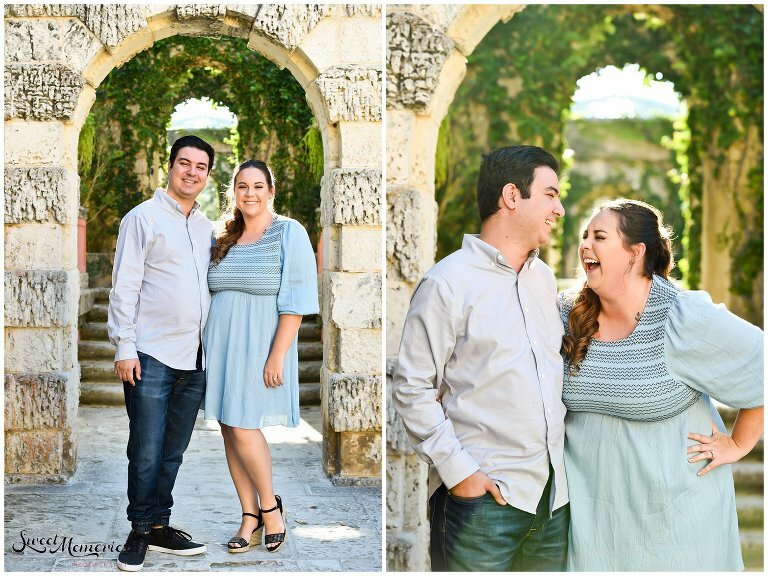 Nicki and Charlie’s Vizcaya engagement session would never have taken place without the help of online dating. And if you didn’t believe in soulmates, the “one, or people who were always meant to be, you will! Because this couple’s love story is exactly that. Both of them work for the school district and only lived miles apart. They could have easily passed each other on the streets. Or been eating at the same restaurant at the same time. However, it’s never that easy to find your person. Thank goodness for dating apps, which have taken dating to a whole new level. It’s now easier to put yourself out there, and to find the missing piece to your puzzle. Which is exactly where these two lovebirds found each other! One year and one puppy later, they’re engaged and celebrating their engagement at Vizcaya, one of the most romantic and beautiful venues in Miami. Obsessed with this venue? Me, too! It’s the perfect spot for a proposal, engagement session, and/or wedding! With its lush gardens, stunning architecture, and breathtaking view of Miami over the water, it’s a must-see!